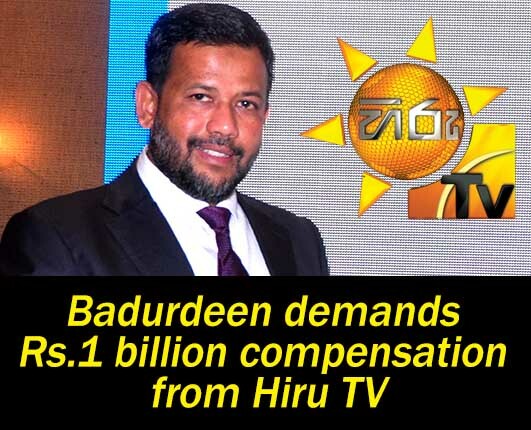 (Lanka e News -15.Feb.2019, 11.00PM) The Minister of Industry and Commerce has claimed Rs One Billion compensation with regard to a statement broadcast on a local TV channel that allegedly damaged his image, reputation and good will. "ඉන්දු ලංකා නිදහස් වෙළඳ ගිවිසුම යටතේ ශ්‍රී ලංකාවේ ගම්මිරිස් වලට තියෙනවා බදු සහනයක්. මේකෙන් වාසිය ගන්න බලාගෙන රිෂාඩ් බදුර්දීන් මහත්තයාගේ සහෝදරයෙක් මේ ඍජුවම සම්බන්ධ වෙලා වියට්නාමයෙන් ගම්මිරිස් ගෙන්නල මේඩ් ඉන් ශ්‍රී ලංකා කියලා සහතික කරලා ඒවා යවනවා ඉන්දියාවට කිලෝ එක රුපියල් එක්දහස් අටසීයට තිබිච්ච ගම්මිරිස් රුපියල් හයසීයට කිලෝ එක දක්වා මේ ජාවාරම නිසා පහතට වැටිලා තිබෙනවා. පසුගිය මාස 8 තුල කන්ටේනර් එකසිය තිස් හතරක් යවලා තියෙනවා. ටොන් දෙදාස් පන්සීයට තමයි අපේ කෝටා එක තියෙන්නේ. රිෂාඩ් බදුර්දීන් අමාත්‍යවරයා යටතේ තමයි වානිජ දෙපාර්තමේන්තුව තිබුනේ. මල්ලි ගෙන්වනවා, අයියා දෙනවා සහතිකය. මේවා ගෙනාවේ ලංකාවෙන් කියලා. ඊට පස්සෙ ආයි මල්ලි යවනවා. මේ සඳහා රේගුවෙන් නිලධාරියෙක් යොදාගෙන තිබෙනවා. මේ සඳහා සම්බන්ධ පුද්ගලයන්ගෙ නම් ගම් මාධ්‍යයේ පළ වෙන්න ඔ්නෙ. මේ රජය පත්වුනේ මේ වංචාවට දූෂනයට එරෙහිව නමුත් මේ රජයේ ඇමැතිවරුන් මැදිහත් වෙලා කරන දූෂණ වලට එරෙහි වන පුද්ගලයන්ට දඬුවම් දෙන්න, ඔවුන් මාරු කරන්න රජයේ ඇමැතිවරුන් ක්‍රියා කරනවා. මේ වර්ජනය හරහා සිද්ධ වෙච්ච ඉතාම හොඳ දෙයක් තමයි මෙය වැරදියි කියලා හැමෝම දැනගෙන හැමෝම ඔවුන් සමග එකතු වුනා. ඍණාත්මක විවේචන කෙළේ නෑ. ඒක නිසා තමයි රජයට සිද්ධ වුනේ කකුල පස්සට අරගෙන මාස තුනකට හරි තාවකාලිකව පත් කරන්න." “Therefore, I am instructed to state that the contents of the said telecasting/ broadcasting is fundamentally false, wrong and have been published by you maliciously, and/or with reckless disregard for the truth and with the knowledge that the said publication will lower my client's esteem in the eyes of the general public. As a result my client has been defamed and brought into disrepute.